Other: First book in The Infernal Devices series, which is the prequel series to The Mortal Instruments series. 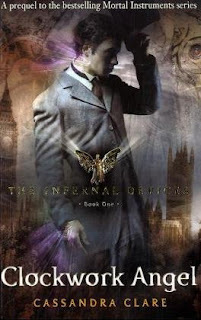 The second book in The Infernal Devices series, Clockwork Prince, will be published on September 6th, 2011. In Clockwork Angel, we are introduced to Tessa, who ventures off to Victorian London, after receiving a ticket and a letter from her brother, Nathaniel. Because she is alone and has no other family in America, she goes aboard the ship to England. Once there, she doesn't see her brother, but she does meet the Dark Sisters - two women who kidnap her to work on her ability. Tessa can transform in another person at will, and this makes her a disirable person to the mysterious Magister. After leaving the Dark Sisters, she lives in the Institute, which is the home to Shadowhunters. Let me say first, that I haven't read any of the books in the Mortal Instruments series. This book can function as a standalone book from TMI and that's why I decided to read it first. I had a hard time getting into the story. The first 150 pages were sort of boring, only showing Tessa and her ability, and the Institute. Even though I understand it's to set up the story, I found myself having a hard time reading the book and I was seriously considering putting the book down. It took so incredibly long to get somewhere. Around page 200 or so, we finally get to see some action. That's where it started getting interesting! We see Shadowhunters, Downworlders and just Mundanes (I liked to think of them as Muggles), who are humans, and we get action. Yes, finally action! After that, the pace picked up quickly and I had a hard time putting the book down when I finally got past the 250/300 page mark or so. Cassandra Clare wrote some pretty nice action scenes, which I really enjoyed reading. I want to point out that I had a hard time imagining what the other characters were like. Will was gorgeous, yet incredibly annoying, selfish and arrogant, and I have the feel that we haven't seen half of Jem yet, which makes it hard to see what he's really like while reading scenes with him. The back of the book tells me that Tessa is torn between the two best friends, but if she is, it doens't transfer from the pages to me as the reader. Having said that (Hi, Simon Cowell! ), I want to say that I actually really enjoyed reading the second half of the book. It left room for the sequel, Clockwork Prince, which I will be picking up when it comes out. 3,5 stars - because the second half of the book made up a lot to the boring first part of the book. I'm glad you enjoyed it! But I'm sorry you found it slow :( I liked this book a lot,as you may well know! There's definitely going to be more on Jem! I can't wait to see more from his character. And Will's, I think. He just confuses me, haha. I didn't find it slow. Probably because I read it a little too fast. >.< I'm glad you liked it enough to give it 3.5 stars. I agree with you about Will. I just couldn't like both the guys. They both annoyed me. Hopefully, I'll like them more in the coming installments. Thanks for the Review. Thanks Naj :) I haven't read TMI so maybe because TID was new for me, I wasn't that enthousiastic like the rest of you all seem to be :) I'm looking forward to the next book though - hopefully it won't be as slow (we're already introduced!) so I keep my fingers crossed! I really enjoy this book but I also think that it was slow at parts. Anyway I think I prefer TID over TMI, mainly because I simply adore London.